How are you supporting the Imps ahead for Saturday's match? As the mighty Imps prepare for one of the biggest matches they have had to face in over 100 years, supporters across the city are gearing up for the historic face-off. The sold-out occasion will see 9,000 Lincoln fans travel to London for the biggest cup tie in the club’s history on Saturday, March 11, for a 5.30pm kick-off. Children at Ermine Primary Academy have made their own special video for the Imps, cheering on their favourite team. A spokesperson for the school said: “Lincoln City’s success has inspired the children to realise that anything can be possible with hard work, team spirit, determination and a positive mental attitude. “We decided that it would be a great idea for the whole school to send their messages of support to the Lincoln City team and, for some of the loyal Imps’ fans, to give their predictions for the match itself. Lincoln City footballers compared teamwork and formations on a visit to the Red Arrows ahead of the side’s FA Cup game against Arsenal tomorrow. Players Paul Farman and Terry Hawkridge met members of the Royal Air Force Aerobatic Team at the Squadron’s home of RAF Scampton, just north of the city. 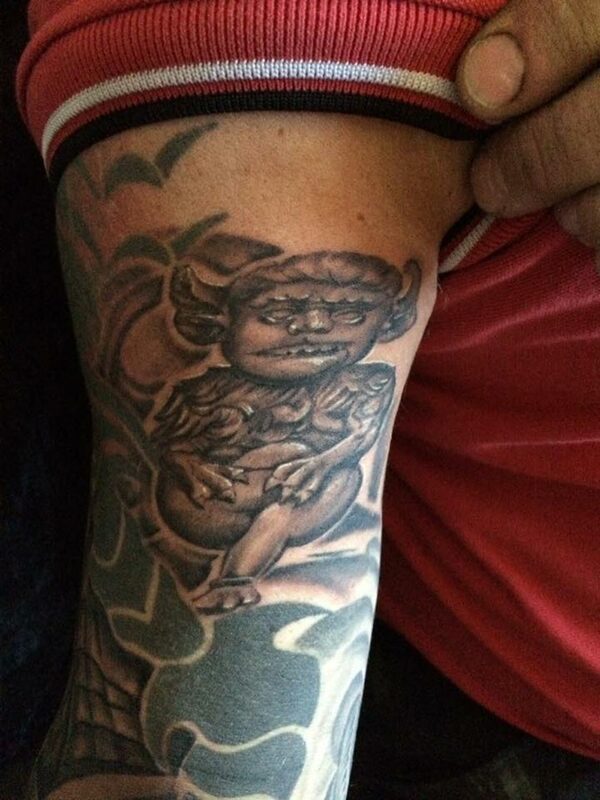 Lifelong Lincoln City FC fan Darren Charlton‎ has had the team’s legendary imp mascot tattooed to his arm ahead of the game. 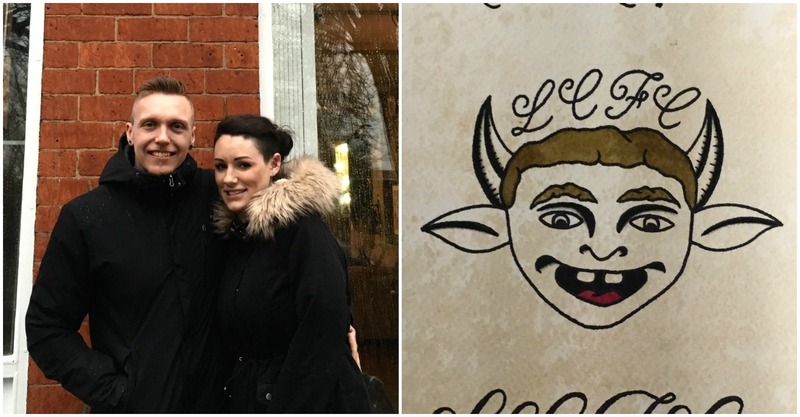 Jays Inks Tattoo Studio, on Garmston Street, has also reported a spike in the number of clients going in and requesting tattoos to show their support of the Imps. 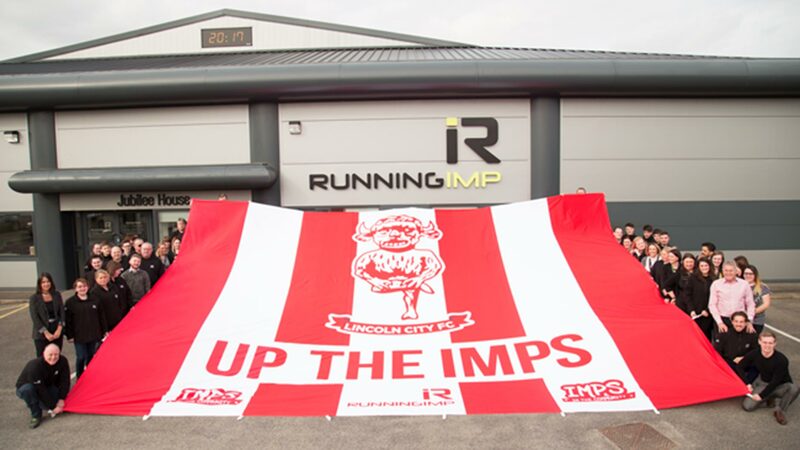 To support the team on their game against Premier League side Arsenal, Running Imp have donated a giant flag to Lincoln City Football Club and Imps in the community. The flag is nine metres by six metres and features the club’s logo, with the slogan “Up the Imps”. 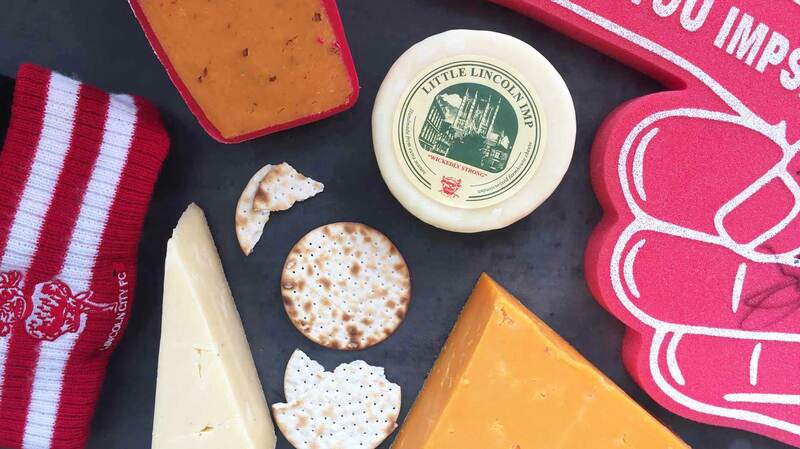 The Cheese Society, based in Lincoln, have put together a special range of cheeses with connections to the the Imps. These include ones from Lincolnshire, imp-related cheeses and any that celebrate the colour red. 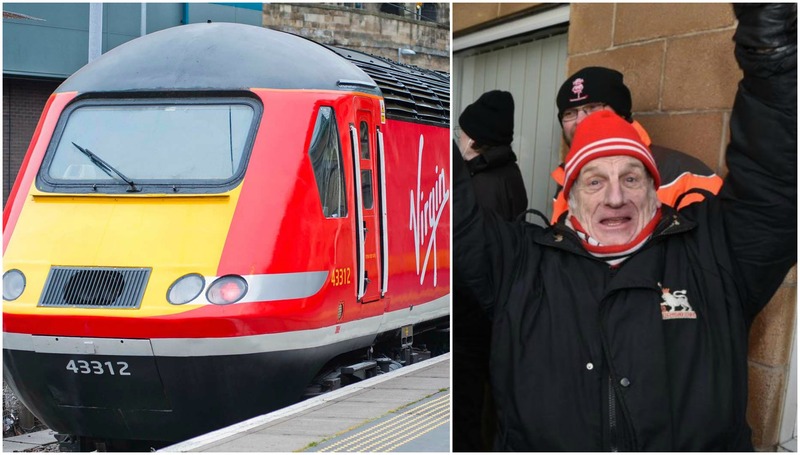 Lincoln City fans will be shuttled to London on a special train. In order to help shuttle Imp supporters to the game, Virgin Trains will run an extra service from Lincoln at 11.16am, returning at 9.20pm from Kings Cross. The usual 9.30am service from Lincoln and 6.08pm from London will also be available to catch. Ahead of an exciting weekend of football, staff and students at Bishop Grosseteste University caught a glimpse of the prize Lincoln City players have been dreaming of for weeks. 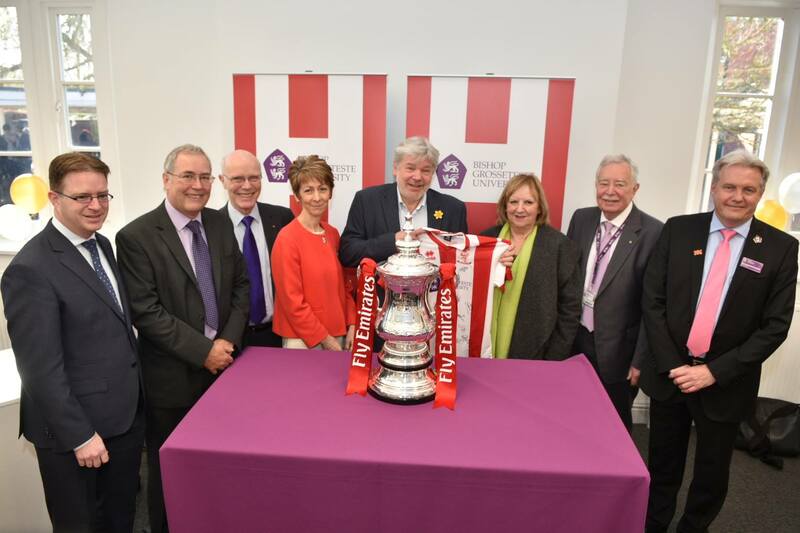 The university, which sponsors the club, arranged for the genuine FA Cup to pay a brief visit on Thursday, March 9. The FA Cup also visited the University of Lincoln ahead of the game. Anglian Water organised a red and white light show on the Westgate Water Tower in support of Lincoln City FC. The light show will be repeated on Friday and Saturday night ahead of the big match. Lincoln College has created this impressive video looking through Lincoln City FC’s amazing journey so far.